Anyone who knows me in real life, know that I'm not only a crazy mom to 4 children but I'm also a Disney freak. I think that along the way, I forgot to grow up and remain a child... a child at heart. In high school I might not have been miss popular but I sure was Miss Disney. I had no shame in wearing my Mickey Mouse watch or sweatshirt so much so at in my senior year school book they added a category just to fit me in and I was named the person the most susceptible to have a job at Disney one day. I frankly didn't care what people had to say about me and that's something that I'm truly trying to teach my kids. Wear what you want, be who you are and forget about what everyone thinks. Disney is not just about the Mouse, it's also all the dresses that they request mom to make. It's a never ending list for the next trip. Just this past weekend I worked on 4 new dresses that I sent to a dear friend for her trip but of course my little one had to try it first and model them. Over the next few days I'll be posting about the beautiful dresses I made for her. 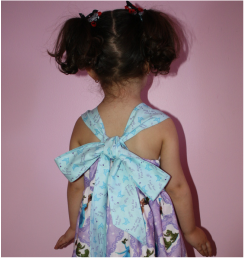 This dress was made using a pattern by Fairytale Pattern Designs named the Anabell's Princess Dress. It a very easy dress to make with nothing too complicated that most beginners can do. The step by step instructions make it very easy for anyone to follow. I've owned this pattern forever but just used it for the first time for this dress. I think a icing skirt by the same designer would be perfect to wear under this beautiful dress to make it fuller. This pattern comes with 2 bodice length. I did the empire waist on this one but there's also a natural waist too. You can opt to add the ruffle to the bodice as I did or simply leave it out. As you can see in my second picture, the straps tie at the back of the dress and not around the neck for more comfort. This pattern includes sizes 0-3 months through girl's size 8 and also includes an 18" doll version. It's a quick sew with lots of charm and perfect for all the character fabric or the natural waist would be perfect for anyone who like to embroider. It has become one of my favorite patterns!